When I first wrote this page, there had been four Local History Cats. 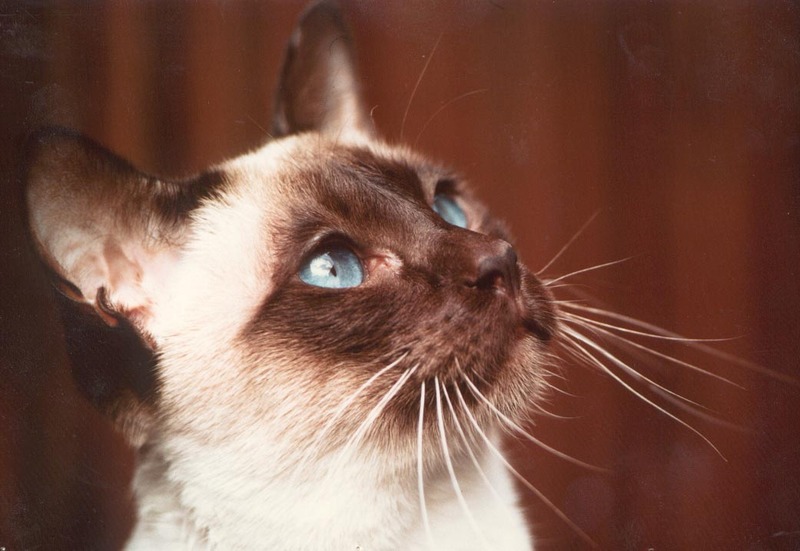 When we started the magazine in 1984, we were ably assisted by Coco, an aristocratic chocolate point Siamese, and Smokey, a grey and white young man who had come to us as a rescue cat. Wild and distrustful, with good reason, of human beings, he adored Coco and, after some initial hesitation, she took on the job of licking him into shape with the same attitude she adopted towards life in general, that of supreme confidence in her own ability. Smokey’s attitude to producing Local History Magazine was, as the picture on the right shows, relaxed. Coco, although she obviously never lifted a paw herself, knew instinctively how to manage the human staff and always made sure that production of the magazine never got in the way of really important jobs, like catering. Unfortunately, just months after we began the magazine, Smokey died of heat stroke during a very hot summer. He was five and had become a most affectionate cat to those few human beings whom he trusted. Coco was devastated and when Rolo came to live with us shortly afterwards, she accepted him with good grace, but as far as she was concerned he could never replace Smokey. Rolo was another grey and white young man, with brilliant iridescent eyes the colour of tiger’s eye. He chatted volubly with all and sundry in a series of wonderful little chirrups and died tragically young, aged one year, when he was run over by a speeding car. It was after Rolo’s death that Miss Jenny Anydots was taken onto the staff. Saved from being drowned, she was the funny looking runt of the litter who grew into a beautiful tortoiseshell tabby with an outstandingly sweet nature. She and Coco never really got on, but Jenny was smart enough to realise that she had to appear to do what The Boss wanted and was able to get her own way in much more subtle ways than we ever realised at the time. Coco had a stroke when she was nearly seventeen and she had to be put to sleep. She was our first cat, so that made her pretty special, but anyone who has ever had a Siamese will know how intelligent and affectionate they can be. It was a hard blow, but Jenny bravely stepped into her new responsibilities as Boss Cat and, as can be seen from her picture above, could often be found supervising business activities in the office. When we took delivery of a new computer system in 2000, she kindly showed Susan how to shrink down an old DOS program into an icon at the bottom of the computer screen by delicately pressing on the Alt key and the Space bar with her derrière; the fact that she wanted her tea and was trying to prevent Susan from typing was overlooked in the general joy which followed this demonstration of computer wizardry. Just before New Year 2001 she had a stroke, from which she recovered very well. In August however we discovered that she had a malignant tumour on her spleen and both were removed in a major operation. Much to our surprise, for she was nearly fifteen, she bounced back from the operation and had a further two months of enjoyable life. In early October however, she started to fade away as the cancer returned and Susan especially had to spend a great deal of time with her as she became weaker. She died peacefully in her sleep in the early hours of 9 November. So now The Local History Press office has no cats to supervise the human workers. There are no cat hairs getting inside the computer mice, no furry bodies lying across the keyboards, no small reproachful creatures whose body language expresses so clearly the opinion that, Sunday isn’t a working day so what are we doing in the office? No doubt in the future there will be more Local History Cats, but for now a suitable period of mourning will be observed and Snofi, who diligently helps Barbara with the book reviews, will have to hold the fort alone. We had become quite used to being without a cat when in March a young man decided to adopt us. Pusskin, as he eventually became, was a typical ‘Felix’ cat, between 1 and 2 years old, of a very affectionate and good natured disposition, although he had a very independent streak and tended to go ‘walkabout’ for anything between 2 and 7 days. We couldn’t for the life of us understand how anyone could lose him and not frantically be trying to find him, but no-one responded to our newspaper and radio adverts, or the web page we set up for him. In spite of the worry of seeing him in places which meant that he was crossing very busy main roads and even a railway line (gulp! ), we settled down together and we two bipedals began to look forward to a life of servitude again. Sadly, it was not to be. A few weeks ago we noticed that he was unusually thin, even for the summer, his coat began to lose its shine and his breathing became laboured. A visit to the vet and a series of tests confirmed our worst fears – he was terminally ill with feline leukaemia and had a lymphoma in his chest. The vet thought that he must have had the leukaemia before he came to us – a product of his wandering and unsettled lifestyle. We cuddled him as the vet put him to sleep and buried him next to the ‘boys’ in the garden. It’s strange how such a little life can have an effect on us. Pusskin pretty much pleased himself where life was concerned, but when he was around us he gave his affection and trust freely and we felt privileged to receive them. Those of us who appreciate cats should never delude ourselves that we mean too much to them — the joke ‘dogs have owners, cats have staff’ rings very true — but nevertheless when a cat chooses a human of their own free will it still means a great deal. We have to report (late 2006) that Snofi, Barbara’s cat, is no longer with us and that The Local History Press is now officially cat-less. We (Susan and Robert) make do at the moment with talking in rather a childish manner through the kitchen window to a long-haired tortoiseshell and white cat who belongs to a neighbour (we don’t know which one) and who recently had two black long-haired kittens — one of which is very bold and one very timid. Quite what they think of these two humans behind the window we don’t know — they don’t stick around very long if we go outside — but we do enjoy seeing them in the garden, even if the mother does pose a threat to the birds which Robert has attracted to the garden by dint of feeding them. Last week another threat to the birds appeared in the shape of a sparrowhawk, which sat on our garden wall for about half an hour. Suddenly all the sparrows and dunnocks disappeared and a lone finch at the nyger seed feeder froze on its perch. We live about three quarters of a mile from Nottingham city centre, so we were pretty impressed to see the hawk, especially as the week before Robert saw a falcon in the back yard of our local florist’s just round the corner from us. Shortly before Christmas 2007 Markiza came to live with us, in rather sad circumstances. A friend of ours had been taken into hospital and it was obvious that he would be unable to go home again when he was discharged. As Markiza had been bequeathed to us in his will, she came to live with us after a prolonged period of being looked after at home. Our friend visited us briefly just after Christmas and Markiza welcomed him with obvious delight, but sadly he died in the spring and Markiza officially became ours. Markiza is a pretty long-haired tabby, as the photographs show, but she has exceptionally short legs and a tail which she cannot move, except for being able to flicker the end of it very slightly. She lives very well with her ‘disability’ and has all sorts of ‘coping mechanisms’, including a rather endearing tendency to stand up like a meercat when she is trying to gauge whether she can jump up onto anything. Our friend got her from the Cats Protection shelter here in Nottingham where she was the cat who had been there the longest. When we contacted the shelter to try and find out a little about Markiza, all they could tell us was that her name was originally Kerry and she had had a litter of five kittens, three of whom had died. Their vet had noted some stiffness in her back legs and thought that she might be prone to arthritis as she got older. I’ve recently been diagnosed with arthritis in my hips, so I have a great deal of fellow feeling for her. It’s no coincidence that all three photographs show her lying down, in fact I don’t think we have a photograph of her standing up. Like an opera singer who has to train every day to keep their voice in good condition, Markiza is very serious about training constantly to make sure that she can always recline to the very high standard that her audience has come to expect of her. Markiza has a sweet nature, although a tendency to occasional short temper means that we are never left in doubt as to when stroking and tickling has to stop. ‘Her Fluffiness’ (thanks, Rosie, for that great name) loves to play hide and seek and a game which would probably have the name of ‘Oh no, someone is chasing me and I must run as fast as my little legs will carry me to get away’. She can get up to phenomenal speeds on her short legs and she also seems to have the ability to materialise right beside you with no warning at all, so much so that I’ve taken to calling her Macavity. So, what about the name? Well, our friend told us that Markiza was an Russian Orthodox saint, but I haven’t been able to confirm that. If anyone is able to tell me anything about such a saint, then I would be happy to hear from them. While researching Markiza in Wikipedia I found that in Poland and other eastern European countries a Markiza was our equivalent of a Marchioness, so for high days and holidays Markiza has become Madame la Marquise. She’s been sitting on the floor watching me while I have been typing this, but has now gone to practise reclining on the sofa in our office. Once refreshed, she will begin the campaign for her next meal of the only cat food which she will eat at the moment, Felix’s Cod and Haddock. Given that there seem to be no sustainable Atlantic cod stocks at the moment, her predilection for for the endangered fish is doing untold damage to our green credentials. Cats, don’t ya love ’em. Since my introduction of Markiza onto this page, she has made a radical change in her diet. No, she hasn’t taken to catching her own food, the mouse and shrew she brought into the house were released unharmed, although we’re pretty certain that the shrew later died of fright. The mouse was made of sterner stuff and lived under various pieces of furniture in the breakfast room, stealing food from Markiza’s dishes and bedding from goodness knows where (we suspect it may be insulation from beneath the fridge-freezer, but that’s another story). Where was I? Oh, yes, Markiza’s diet. When Markiza came to live with us she was accompanied by a bag of Iam’s dry cat food. None of our previous cats would countenance Iam’s, so when Markiza didn’t eat it we thought she would prefer something else, which was when the long, frustrating and expensive search began for something which she would eat. Now, we have shared our house with six felines, so you would think we were a little wiser in the ways of cats, but no, we assumed she didn’t like the Iam’s, not that the change in her circumstances would upset her enough to put her off her food. Duh! Anyway, a few weeks ago Robert finally snapped and, exhausted by trying to choose between the myriad versions of cat food available, bought a bag of Iam’s dry cat food. Markiza has been happily munching away on it ever since. This has set me wondering whether Markiza has merely gone back to eating the food she has always prefers, or has she been influenced by television advertising? She has been in the living room on a number of occasions when a gorgeous Siamese cat has appeared on the television to assure us, in Leslie Phillips’s wonderfully mellifluous tones, that “I am not just a cat, I am an Iam’s cat”. When our beautiful 18-year old Snofi died in September 2007 I vowed never to go through that emotional trip again. But my husband, Peter, wanted a cat and so in April 2009 we went to the local cat rescue shelter, strangely called BARKS (Banbury Animal Rescue and Kindness Shelter) — they never have taken in dogs! There was 8-month old Clio as they called her — abandoned and brought to them by a lady who could not cope with her. Because she has a moustache we renamed her Tashi and here she is. Very vocal — I suspect some Siamese in her background. And very amusing — canters rather than runs and sometimes trips up in her enthusiasm. Up various trees with somewhat of a surprised look on her face. We are getting on well!